The whole concept came into being in 2011 and since then it has gone from strength to strength. It is predominantly a voluntary organisation. As our programmes we have created an incredible level of interest and all our courses are booked as soon as we announce them. Our objective is to run these programmes 52 weeks a year and use our crew’s expertise to run promotional activities for others. Recent example of this being, Ablevision being funded by Meath County Council under the Caranstown community scheme to prepare a documentary on the statue erected in Duleek and for which artist Maurice Harron of Derry had been commissioned. Upstate Theatre company’s Declan Mallon and Collette Farrell helped on our first projects. 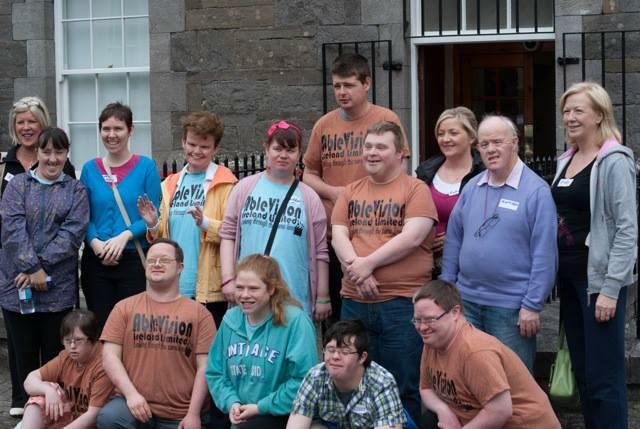 Ablevision completed its latest cross border project with a group from Newry in a film screening in Newry which saw a collaboration between Gateway in Newry( Social club for adults with intellectual disability) and Ablevision . We got funding from Department of Arts , Culture and the Gaeltacht and used the Creative Spark Centre in Dundalk with assistance from Media Studies in Dundalk. Orlaith and Gavin Duffy of Gavin Duffy & associates have been terrific sponsors and workers for the cause. Barbican Centre in Drogheda have facilitated many of our courses. Droichead Arts Centre support us and we have had our work on show in the marvellous space that is there.